Ask fellow campers about "Bonanza Gold Motel & RV Park" and nearby attractions. We reserved this park just in case we needed the RV wash as we crossed Top of the World Highway. It was a rainy day so the answer was yes. Having that RV wash was essential to getting off most of the mud before it dried. The sites were back in, reasonably level, and were not noisy where we were staying. The staff was helpful on check in. Cellular service was good. We would stay here again. We camped at Bonanza Gold Motel & RV Park in a Motorhome. We spent 3 days exploring Dawson City - PLENTY to do... just go to the Visitor Center for information. Highly recommend any of the Parks Canada tours. These will cost extra as your park pass will not cover them, but they are worth it. There is a combo museum ticket that we didn't realize until after we had gone to 2 of the 3 museums. We did drive up The Dome for a sunset which was affected by the forest fires. The RV park is a parking lot at the back of the Hotel. We were here in late Aug / early Sept, so not very busy. The nasty part is that truck drivers, hitch hikers, and people who camp/sleep in their cars and vans: use the washrooms, showers and laundromat. The place is a dirty mess. Services were the only thing that worked. Being parked behind a hotel, has its disadvantages: car alarms, horns blaring to lock and unlock. The WiFi is slow and cannot download. We camped at Bonanza Gold Motel & RV Park in a Travel Trailer. There is a fantastic Golf Course, a drive to the top of Dome mountain, and of course downtown where everything is so overpriced. We arrived on a rainy day after having driven the Top of the World Highway in the rain. We were tired, wet, dirty and hungry. There are no pull-thrus but the clerk gave us a site that we could pull thru to the font, leave our car attached, eat dinner and then go to the RV and car wash. Very nice and we appreciated the courtesy. We ate and then circled to use the RV and car wash. It was at least 1" deep in mud because of all the use it had had that day. The campground has lots of potholes and ruts to drive around. The sites are back-in, quite close and back to back. They are level, the hook-ups are good but have no picnic tables or fire pits. The campground could use a lot of tender, loving care but it was ok. We would use it again if we were in the area. We camped at Bonanza Gold Motel & RV Park in a Motorhome. The Robert Service cabin has a marvelous guide who tells you about Mr. Service and recites several of his poems before you tour his cabin. The Jack London cabin also had an excellent presentation. We especially enjoyed the two young guides who were at the museum. Both excellent and knowledgable. One took us through the railroad shed and one showed us all about how to pan and sluice for gold. Then they both showed us what justice was like during the Klondike Gold Rush. Excellent presentations. The short back-in level dirt sites are behind the hotel. The utilities worked well but the Wi-Fi was very slow. We also had no Verizon cell service here. They have a nice pay paved RV wash station. The host was friendly and helpful. We would stay here again. We camped at Bonanza Gold Motel & RV Park in a Motorhome. There is a nice path to Dawson City which is about 3 miles away. If coming from the north do not turn in at the wash station, the main entrance is on the far side of the hotel. This is an OK park a couple of miles outside Dawson City. Fortunately it was not crowded when we were here so we had plenty of room. The sites are close together and small but acceptable. The hookups were fine except every other site had hookups on the passenger side of the coach and for whatever reason the office staff uses those first. We had to go back and ask to move to the empty site next to us to get hookups on the correct side. We stayed here in a motorhome for 3 nights and on the last night someone came in and they were put right next to us so their hookups were on the wrong side. Again there were many empty spaces so there was no need to do this. All utilities worked good. Wifi worked OK but was an extra charge. We would stay here again. We camped at Bonanza Gold Motel & RV Park in a Motorhome. If you're there for the farmers market on Saturday and you want some really fresh veggies, it is the place to go. We have stayed at two parks in Dawson and this is the better park. WiFi is not great, but is usable. Staff is friendly and helpful. Bath house is clean. On the negative the gravel is very dusty and the sites are quite crowded. Shade on some sites, but not many. No features to separate the lots. We camped at Bonanza Gold Motel & RV Park in a Fifth Wheel. 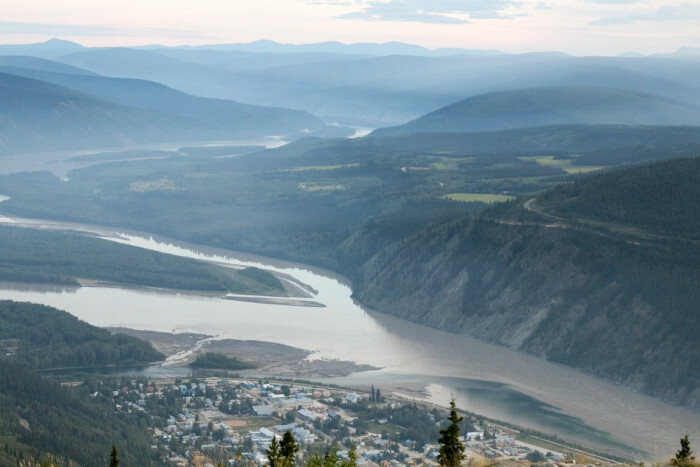 Dawson City is a historic mining town and the city has a very complete history program for tourists. We took two different walking tours plus visited some historic "homes".... including Robert Service's cabin. We missed Jack London's cabin. The Drunken Goat (Greek) and Klondike Kate's are good dinner options. The First Nation Cultural Center is worth a visit, but not great. It seems common that the RV parks in Dawson, like many other cities, take full advantage of every foot of real estate to maximize rental space. We were packed in so tight that we could just extend our slides and that was it. The dog in the next site, occupied by a seasonal guest, was chained so that we had to ask that his tether be shortened so that we could get our dog in and out of the coach. For 3 days it wasn't a problem. If we had planned on staying a week it would have become an issue. The basics were all functional; good water, sewer and 30 amp power were fine. Cable TV was excellent but the property, over all, was not in the best of condition. We did visit the downtown RV park and it was in much the same state. In Dawson, this is how things work. The staff was less than friendly. Be sure you get the conversion rate!! We camped at Bonanza Gold Motel & RV Park in a Motorhome. See Dredge #4 and do some panning at Claim 33! This was our least favorite stop on our way to Alaska. Campground very crowded, lots of unused material around, looks like many residents. Some sites are hard to get into, very close together. Internet very slow. No room to walk the pup. Full hook-ups with good cable TV. That is the only reason we would stay here again. Dawson City is a wonderful little town. We would stay at the park in town next time, for the convenience. We camped at Bonanza Gold Motel & RV Park in a Travel Trailer. We were here early in the season, so the campground wasn't full. This allowed the owners to leave an open campsite between us an our neighbor, so we had plenty of room to move around in. Even where the campers were side by side, there was still room to sit outside and enjoy the unseasonably warm weather. Services were all good, including the Wi-Fi. We had great luck using it, but I can see where it might be slow if the campground is full. Still, we had no problems and often had both computers going while we were in the camper. Other campers in the park were very friendly, including those who were camped there for the season. We will stay here again if we find ourselves in Dawson City. We camped at Bonanza Gold Motel & RV Park in a Fifth Wheel. Don't miss the shows at Diamond Tooth Gertie's. The singer has a great voice and personality. The dancers do a good job, too. We think this is the park to stay when in Dawson City. Sites are level and there is room for everyone to be comfortable, even if side-by-side. The managers/hosts are all very friendly and helpful; full of information about the area. There is a small book exchange in the laundry room; books can be purchased for a donation to KIVA. We left our motorhome here for the 4 days it took to drive to Inuvik, NWT and back. Management worked with us to allow a move into a electric only site to keep our refrigerator and freezer working, and to return to a full-hookup site upon our return. We highly recommend this park to anyone visiting the area. We camped at Bonanza Gold Motel & RV Park in a Motorhome. Friendly. Clean site. Gold panning equipment and advice free (loaners). Nice walk to town. We camped at Bonanza Gold Motel & RV Park in a Motorhome. Big gravel park, but spaces aren't huge. Poor Wi-Fi, good cable TV. On the main road but relatively quiet. We camped at Bonanza Gold Motel & RV Park in a Motorhome. As others have said, this is basically a gravel/dirt parking lot. We had no problems with the water/sewer/electricity, but the Wi-Fi might as well been non-existent. One of the workers at the campground came around one morning and told us to make sure we told the managers about the Wi-Fi, and when I went to the office, the manager jumped all over me as if it were my fault. I would stay somewhere else if I ever visit Dawson City again. We camped at Bonanza Gold Motel & RV Park in a Fifth Wheel. This is a big gravel and dirt "park". Our site was adequate and level. Hookups were good. 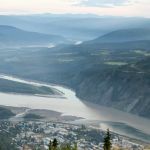 I got Wi-Fi on my better computer; my wife got intermittent WiFi; it was slow because there are no high speed lines in Dawson City (was told they stopped about 100 miles short of the area). It could get dusty - at one very windy point, I tried to point out the office to someone who had come in the back way, but I could not see it. Staff here was very friendly and helpful. There was no cell phone reception and I had to make a work-related conference call, so they set me up with a land line in an empty motel room (charged to a phone card) and it worked very well. Then we parked for two additional nights (for $10) while we took our toad up the Dempster highway. The physical experience was only adequate, but they were so nice, we would definitely stay here again. We camped at Bonanza Gold Motel & RV Park in a Motorhome. This park is not much more than a gravel pit full of potholes and weeds. The sites are very narrow, when slides are out, almost touching the next van. Wi-Fi is extremely limited and slow and they do not tell you upon check in that it is capped and once you use your quota for the day it is not reset until 2 pm the following day. Very inconvenient. Overpriced for what you get. Nobody seems to care about the appearance of the place. There is a good vehicle wash $ which is handy after traversing the dirt roads to here. We would not stay here again. We camped at Bonanza Gold Motel & RV Park in a Fifth Wheel. There is a nice path to Dawson City which is about 3 miles away. If coming from the north do not turn in at the wash station, the main entrance is on the far side of the hotel. Are you affiliated with Bonanza Gold Motel & RV Park ?